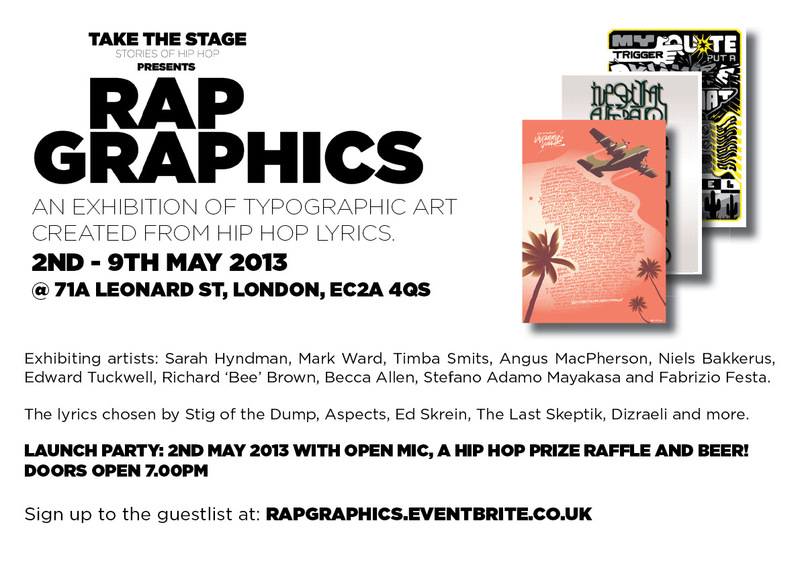 Take The Stage: Stories Of Hip Hop proudly presents the Rap Graphics exhibition @71a gallery in Shoreditch on 2 May. Tired of cliched hip hop imagery, the premise was to ask select acts for their favourite lyrics as inspiration for a bevy of illustrators to flex their typographical skills. Contributors include Sarah Hyndman (The New York Times, Hill & Knowlton), Mark Ward (Nike, Mountain Dew), Timba Smits (Thames & Hudson, Wired), Niels Bakkerus, Angus MacPherson (Little White Lies magazine) and Fabrizio Festa (HUCK magazine). Lyrics chosen for the illustrations were picked by names including Stig of the Dump, Aspects, Ed Skrein, The Last Skeptik, Dizraeli, Delusionists and more.